Chefville is a popular cooking game on Facebook that takes players on a culinary adventure. The main goal of the game is to discover new recipes, cook for hungry patrons, and design your dream restaurant. It was the number one cooking game on Facebook with up to 4.8 million daily active users. Some of the partnerships like Food Network's Robert Irvine, Chef Jamie Oliver, Progressive Insurance, California Milk, Bounty and American Express were featured in Chefville. Over 2,000 dishes were painted and 300 cook stations designed. Role and Responsibilities: I art directed Zynga's Chefville from concept to production and maintained live features. I managed a team of 20+ artists to develop in-game assets, Ui and marketing materials. I worked closely with Game Designers, Artists, and Product Managers on new game features. This was the first concept art of a restaurant I designed to sell the art direction of the game. In the game, you can design different types of rooms like a kitchen, dining rooms, and farm area. 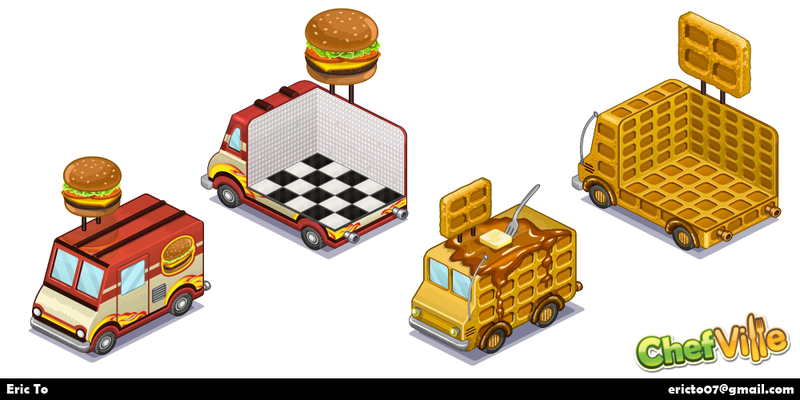 Assets for the food truck feature.